The suspect in the NYC Terrorist Attack was reportedly interviewed by federal agents in 2015 under the suspicion that he had ties to terrorists. A critical piece of information has emerged in the case of a terrorist attack that killed eight people in New York City on Tuesday—the suspected attacker was reportedly interviewed by federal agents under the suspicion that he had linked to terrorists in 2015. 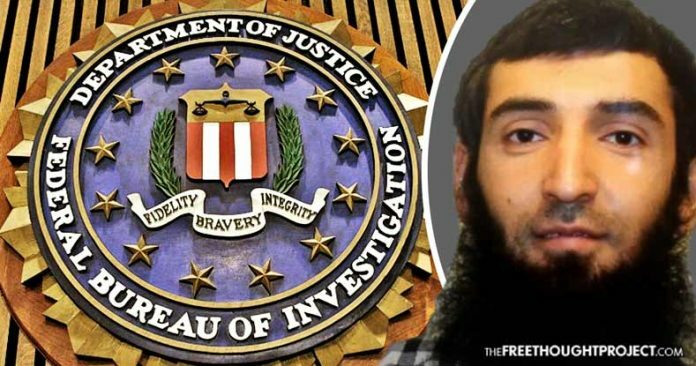 The initial information released on Saipov, a 29-year-old immigrant from Uzbekistan, painted the picture of a friendly Uber driver who slipped under the government’s radar after he came to the U.S. on a Diversity Visa from a country off of the government’s terrorist map. The truck attack that Saipov is suspected of carrying out is being painted as a “lone-wolf attack,” in which he began yelling “Allahu Akbar” after he exited the vehicle, waving a paintball gun. He also reportedly left a note at the scene claiming that he carried out the attack for the Islamic State—although no proof of that note has been released. New York Governor Andrew Cuomo said that the suspect was “radicalized domestically” after he came to the U.S. legally in 2010. “The evidence shows—and again, it’s only several hours, and the investigation is ongoing—but that after he came to the United States is when he started to become informed about ISIS and radical Islamic tactics,” he said on Wednesday morning. While the attack is being hailed as the “Deadliest Terrorist Attack in New York since 9/11” that shows the threat of ISIS attacks on U.S. soil, it is also the textbook example of the failed War on Terror. As we’ve learned from subsequent FBI investigations, one even announced last month in which a man was supported by the FBI, given a fake bomb and told to blow up a mall in Florida, the bureau has an extensive network of informants and patsies ready to do their bidding in carrying out staged terror attacks. Once these fake attacks are carried out, the FBI then takes credit for preventing a terrorist attack, thereby validating their anti-terrorist budget and activities. Some critics of the FBI call those actions nothing less than entrapment. And without the help of the FBI, those individuals would arguably be going about their everyday activities, unconcerned with carrying out acts of terrorism. The FBI’s anti-terrorism activities, some have said, actually create terrorists out of regular citizens. After Sayfullo Saipov was interviewed by federal agents in 2015 about suspected connections to terrorists, he arguably would have stayed in their system for the next several years, and if he did , in fact, spend “a number of weeks” plotting a deadly attack, then the government agencies who receive billions in taxpayer dollars to combat terrorism, should have had enough time to prevent it.